Two projects from Agriculture and Natural Resources (ANR) Communications recently received Association for Communications Excellence (ACE) awards. The ACE Critique and Awards (C&A) program recognizes individuals and teams for excellence in communication and technology skills. The Michigan State University 4-H Revolution of Responsibility campaign earned a silver award in the category for a marketing communications campaign with a budget of $1,000 or above. National 4-H launched its Revolution of Responsibility campaign in late 2010 and early 2011. Michigan was one of the first states to adopt the campaign and use it as part of an event in early 2011. Since then, Michigan 4-H has expanded on its use of the Revolution of Responsibility theme, specifically to inform decision-makers at the local, county and state levels of the importance of 4-H programming. A team in ANR Communications worked together to produce an award-winning campaign. Communications manager Michelle Lavra developed the overall strategy, came up with the original tone of execution for Michigan’s version of the Revolution of Responsibility campaign, wrote the copy and designed the original fliers, posters and banners, provided photography, sought out stories, wrote video scripts, conducted interviews for videos and wrote some of the print stories. Technical writer Katie Gervasi wrote print stories; worked on story fliers, marketing fliers and posters; posted Web content and social media; provided photography; handled development, design and production of promotional items; and handled all of the logistics for banner orders, printing and distribution. Natasha Berryman, a former writer for ANR Communications now an AgBioResearch communications manager, wrote print stories, designed and populated story fliers, posted Web content and social media, and provided photography. Multimedia production team leader Steve Evans was the producer and videographer for all three videos. He also wrote scripts, did all of the video editing and posted the videos to our YouTube site. 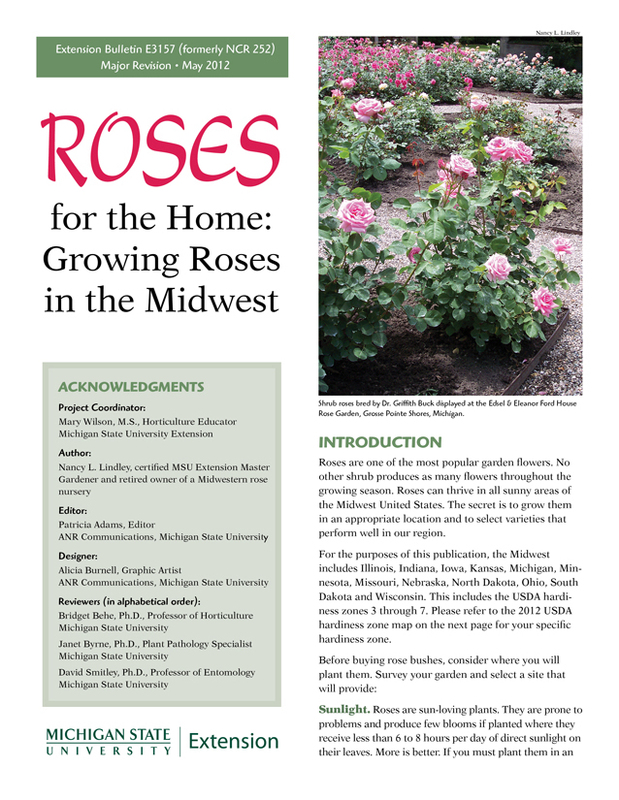 Roses for the Home: Growing Roses in the Midwest (E3157), a revision of Roses for the Home, won a bronze award for a one- to full-color popular publication. ANR Communications graphic designer Alicia Burnell designed the rose bulletin and Patty Adams edited it. Mary Wilson, MSU Extension horticulture educator, acted as project coordinator on the effort. Rose expert and MSU Extension Advanced Master Gardener Nancy L. Lindley wrote the bulletin. Mary; Dr. Bridget Behe, MSU professor of horticulture; Janet Byrne, MSU plant pathology specialist; and Dr. David Smitley, MSU professor of entomology; lent their expertise as reviewers. Read more about the publication in this June 2012 Spotlight article. Congratulations on these two award-winning projects! It was a long time in the making, but a revised MSUE rose bulletin is now available from the MSU Extension Bookstore. It was worth the wait. The book is not only beautiful, but also informative. Produced by ANR Communications, Roses for the Home: Growing Roses in the Midwest (E3157) is a revision of Roses for the Home (NCR 252). Mary Wilson, MSU Extension horticulture educator, acted as project coordinator on the effort. Rose expert and MSU Extension Advanced Master Gardener Nancy L. Lindley wrote the bulletin. Mary; Bridget Behe, MSU professor of horticulture; Janet Byrne, MSU plant pathology specialist; and David Smitley, MSU professor of entomology; lent their expertise as reviewers. The 32-page rose bulletin will make even the gardener who is hesitant about growing roses confident enough to dig in and get going with the popular perennial. Though the bulletin isn’t as large as a coffee-table book, you’ll want to put it on display due to its colorful photographs. The excellent and practical information and useful diagrams and tables put forth in the book make it a reference that rose gardeners will refer to again and again. Please promote this book in your county offices. I’ll add my confession to opting for those super-easy ‘Double Knock Out’ roses as a solution to my desire for blooming roses and my lack of expertise at keeping the things healthy and vibrant. Maybe with this bulletin, I can be brave and branch into varieties that maybe take a bit more attention and knowledge, but also pay off with some incredible eye- and nose-candy in our landscape. Order it from the MSU Extension Bookstore at bookstore.msue.msu.edu. At $6, it’s a bargain.